This is the true test for the Bunco player ... Does she love Bunco enough to take it with her everywhere she goes? She can with this sleek, classic , sterling silver and stone bracelet. The three minature dice come in assorted colors. 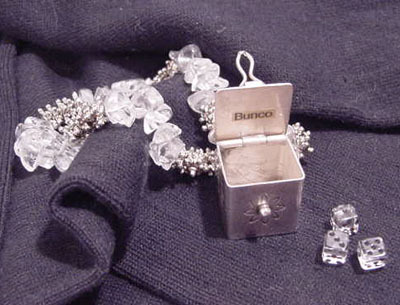 Made for the Bunco Players that love jewelry, attention, and sterling silver. This is sure to start a conversation about your love for Bunco. Allow 2 to 3 weeks delivery. Each style varies. Bunco Dice Bracelet 010150B We regret this item is not available at this time.